This week we solicited your questions for Dan Hamermesh, a regular Freakonomics contributor, and author of the new book Beauty Pays: Why Attractive People Are More Successful. A lot of you chimed in with thoughtful questions about the relationship between success and beauty. Hamermesh has obliged by answering a great many of them, which you’ll find below. As always, thanks to everyone for participating. A. I’ve never seen a study of this, but my intuition is the same as yours. If you have another desirable characteristic, such as beauty, you might be more willing to indulge your tardy behavior. A. That’s certainly the case. Chapter 3 deals with whether beauty is affected by weight; and the evidence is pretty clear that, except for the morbidly obese, our weight doesn’t affect others’ perceptions of our looks. Looks are based on what people perceive about our face. A. That’s a tough question. This economic force is, in my view, totally atavistic, yet it’s pervasive. I like to think that I, and our children, have done our best to inculcate in our offspring the notion that this shouldn’t matter—I guess by correcting them gently if they make a “lookist” remark. But it’s difficult. A. Cute final line!!! I wouldn’t recommend any of your solutions, that’s for sure. Rather, as the book advises, take advantage of what you’re good at—other things in which you have a comparative advantage. Looks are only one of many things that affect success—and surely you, like everyone else, have other characteristics that can help you get ahead. A. I don’t know the answer to your final question—I’ve seen nothing on it. But I did look at some data that had both others’ ratings of a person’s beauty and his/her self-rating. They were very highly positively correlated, suggesting that people are aware of how good- or bad-looking they are. Interestingly, on average, ratings by other people were higher/more favorable by a little bit than were the self-ratings. A. Sadly, most people are pretty aware of their own looks, so I don’t think this strategy is going to work. Sorry! A. The evidence suggests that beauty, like so many genetic endowments, is uncorrelated with other things that are genetically based. Now it may be that, knowing you’re good-looking, you don’t bother developing in other areas; but it’s equally possible that your beauty gives you the self-confidence to develop a great personality too. A. Maybe there is normally a featured post that stays at the top for a day. This is the first one that I have noticed. A. True—but the history suggests things have been very similar for a very long time. Indeed, while standards of beauty have changed somewhat, go back and look at 19th century pictures and you’ll have no trouble picking out the ugly and the gorgeous. A. I’ve seen this study; but in two of my own pieces, and others I’ve seen, there is little or no correlation between looks and intelligence. Moreover, in several studies others and I have held constant (adjusted statistically) for intelligence, and that adjustment has not altered the estimated impact of looks on earnings. So the answer to your question seems to be a clear no. A. The one study you quote was not of actual hiring, but of intentions to hire. In general, as you move up the looks scale, both among men and women, you do better. I’ve only seen when case where that wasn’t true—on the odds of making partner in law firms if you are a truly gorgeous woman. A. Great question—put differently, what if we all got more beautiful? I don’t know, it’s very hard to get at that statistically. I’m trying to do some work now on a closely related topic. A. I’d say that the worst case scenario for them would be waiting tables or something, whereas for an unattractive man the worst case is permanent unemployment or something like commercial fishing or garbage collector, etc., and even then they’d still be lucky to get the job. A. No, like so many characteristics, looks are much less heritable than most people think. A. It’s clear that, except for the morbidly obese, ratings of looks are independent of weight. I’ve seen nothing on teeth, though. Q. Beauty is a funny thing – and as I’ve heard, isn’t it in the eyes of the beholder? If Mr. Hamermesh is still taking questions, I’d like to know how accurate he believes the ratings on ‘beauty’ are, and what accounts for it – general opinion or the golden ratio? What about age and race discrepancies between raters and rates? –Yefan C.
A. Sure it’s in the eye of the beholder, but people tend to agree—not perfectly, but substantially. And ratings differ by age, and by race, and by gender. And there are slight differences depending on the gender/race of the rater—but not huge differences. Check out Chapter 2 of the book on this. A. One set of data had both others’ and our own ratings. The correlation was extremely highly positive. However, on average others tend to rate us slightly better than we rate ourselves. And women are slightly more accurate (more in accord with others’ ratings) than are men. "...the evidence is pretty clear that, except for the morbidly obese, our weight doesn’t affect others’ perceptions of our looks. Looks are based on what people perceive about our face." Err... You ARE male, aren't you? For AaronS ( how to utterly defeat pretty people). How to do this is described in detail in THE BASEMENT, Kate Millett's semi-fictional book. I'm interested in learning about the (negative) correlation between looks and age — as people (especially women) age, past a certain age women, primarily are less beautiful than when younger. It seems to be less so for men —does the book address age and beauty? If I recall correctly, the first chapter of David Brook’s The Social Animal cites research suggesting that breast size and bust/waist/hip ratios influence a man’s perception of a woman’s beauty. I see you mention that there is general agreement about what is considered beautiful. So is there any social aspect to this at all, or is a genetic determination to find some attributes beautiful more powerful than any social factor? You have mentioned twice that there seem to be no corelation between beauty and intelligence. I believe you should take a closer look at corelation between beauty and emotional intelligence as defined by prof. Seligman. He proved that emotional intelligence plays a greater role as a success factor than old-fashioned, regular inteligence. So, better look means higher self-esteem though higher emotional intelligence though higher success rate. Would be nice to have some data on that. Most of the richest people in the World are not attractive...Buffett, Gates, Ambani...look at Forbe's list. That's because there's probably no correlation between beauty and extreme greed. Do not believe this. The men I know like a pretty face, but are MUCH more concerned about a good body -- and disdain overweight women. Would the appearance advantages work with food? Would people eat something because it looks good and not because it tastes good? I can't agree that weight is independent from looks...How many of you have been wildly attracted to a short man or a fat woman? Body is definitely the foremost determinant of attractiveness. I think that mediocre-to-ugly people are usually victims to looking like their bodies never fully matured--guys that are short or look young, or women that lack the post-pubescent waste to hip ratio that men are attracted to. Actually, now that I think about it, I guess the face of a guy probably matters more than the body, as opposed to women. A guy with a young looking face is doomed. A woman can have a Michael Jackson face, but with a bangin body, attract many men. Simply from overhearing Howard Stern blabbering away on satellite radio, I would say you're right. It seems a woman can be a 'butterface', but far more of interest to the average man is the 'bangin' body'. Sociologist Dan Ariely has a reallllly interesting take on looks, relationships, and identity, even invoking "The Fox and the Grapes" from Aesop's Fables to demonstrate how our attitudes conform to the limits we were dealt in the genetic lottery. "Now it may be that, knowing you’re good-looking, you don’t bother developing in other areas; but it’s equally possible that your beauty gives you the self-confidence to develop a great personality too." Most people would agree with the fact that beauty get you places. Sinse most people agree on attractiveness, getting a job can sometimes depend on looks. For example, if you have to equally qualified women, the one who is more pleasantly attractive will get the job. Hamermesh notes that when a woman is hiring, jeleousy can come into play. They might not pick the more attractive candidate for fear of jelousy. Especially in a group setting such as high school, the majority of the class seems to get along with those who are more attractive. There are some people who most would not call attractive, but make up for it in personality. I believe highy in appearance affecting personal relationships. The reason because if your great looking (like myself) you cant just have one girlfriend, you need to have plenty because thats what looks are for. You're fishing and reeling in a bunch of beautiful fishes. If you're not good looking than you nned to have a girlfriend so you don't look weird. But of course your girlfriend wouldn't be good looking either unless you're rich or something. Many good looking highschool kids are popular because they are just simply good looking. Some ugly kids are popular to, because of they're personality or they party hard, etc..
What I think about this topic is that yes, better looking people are more popular and successful. For example the beautiful Kait Parker (Weather Girl for channel whatever news) brings in views for that channel of news. She hooks me on to watching that news channel, and yes I don't pay attention to news so I don't know what channel it is. "Attractive people may be more successful, but hot chicks are also dumber" in this case stated earlier Kait Parker could be your typical blond and dumber than other girls(Not a fact, just opinion)but still get the job because of her stunning gorgeousnes.As well as Erin Andrews, and Kurt Herbstreet on College Gameday show, aired on ESPN channel they get more publicity and are on more commercials to promote the show more than Desmond Howard and the other guy because they make the show more intriguing. Again yes I don't no the other guys name because he's not good looking. Not Lee Corso, everyone knows him. Plus ill admit Kurt HerbStreet is a good looking dude. Hello, my name is Alana Bickmore. I am from Tasmania, Australia and I am currently studying in my final year of schooling, before I progress onto university next year. One of the many subjects I am studying this year is Health Studies, and in this subject I am currently completing a major student directed inquiry project on the health issue of body image. I am currently researching how unobtainable the ideal of the perfect body is, and how it has been bombarded upon society for so long by various media outlets, that it has become embedded into our culture. Most recently I've researched the value placed upon beauty, and how despite the infamous saying "Do not judge a book by its cover", it seems that when push comes to shove, appearance does matter. 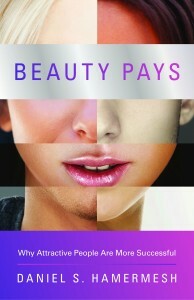 This has led me to your book 'Beauty Pays', but despite reading many reviews and information about it online, I have no time to order a copy. Although I am aware that you are not Australian, and my report requires Australian statistics, I have a feeling that the research presented in your book can virtually be applied globally. If you could perhaps give me a brief overview of the studies/statistics shown in your book on how attractive people are favoured... and perhaps inform me if I can apply these studies from an Australian perspective, it would be greatly appreciated. Thank you! Hi, Dan! I have two questions-- (1) Have you studied beauty and student grades? Does gender of teacher vs. gender of student matter? (2) What about the spousal jealousy effect as a negative factor in hiring? If I am the male boss and I am hiring an assistant, wouldn't it be safer, in terms of keeping the peace with my wife, to hire a homely rather than beautiful female assistant? Even safer to hire a male assistant?